Doing the "Human Knot" challenge during our training. 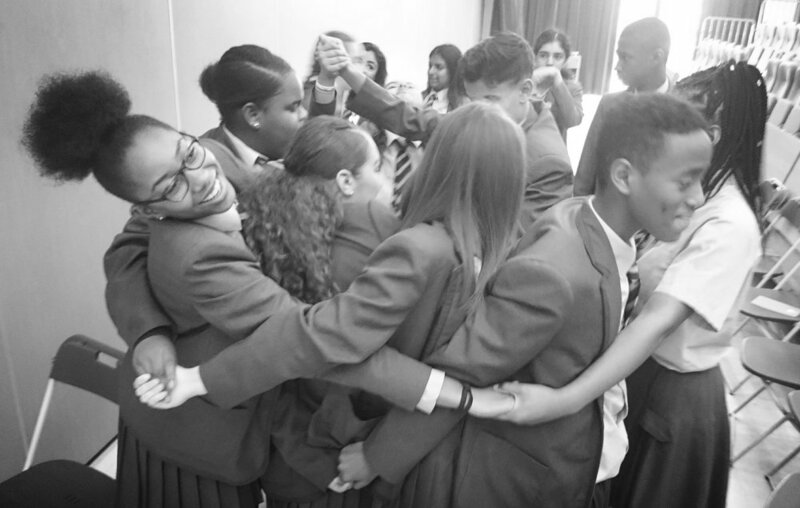 The Franklin Scholars are some of Walthamstow Academy's most promising Year 10 students, who have been recruited and trained to provide a year-long programme of mentoring and literacy support to Year 7s who have struggled in the transition from primary to secondary school. Prior to starting the programme we received two full days of training. The first day consisted of us learning how to properly engage with the Year 7s and the relevant topics/activities that we would need to carry out with them. On the second day of training we met with the group of Year 7s who would be taking part in this year's programme and we were given some time to interact with each and every one of the Year 7s. This was beneficial to both parties as we got a basic understanding of each other and this also helped them to feel more comfortable around us as we were then assigned to our individual mentees. From that point on the Franklin Scholars sessions have been taking place every Tuesday and Wednesday during form time. Each and every Year 10 mentor has built a strong bond with their Year 7 mentee. We think that the Franklin Scholars programme is an amazing opportunity seeing as being Year 10s we know how overwhelming it can be to be in Year 7 due to the drastic change of environment. Through this programme we get to support the Year 7s at the start of their secondary school journey. I am one of the many proud members of the Franklin Scholars team in Year 10 and we believe that when one teaches, two learn.